It was never going to be a fair fight was it? Barcelona against Real Madrid and the clash of the ego of Jose against the sheer technical brilliance of the entire Barcelona squad and the individual talent of Lionel Messi. But this was merely an appetiser for the two TV ads that followed. Walkers Crinkles Crisps getting it’s first airing and the beautifully filmed Peugeot 508 ad. And then came the Peugeot 508 with its lovely cinematography. All moody, dark and mysterious. A bit like the opening of Time, by Pink Floyd on Dark Side of the Moon. It was going so well. The stress of a day building up and up. Where is it taking us? Don’t I wish I looked that stylish after a stressful day. And then he got into a Peugeot. I don’t want to be a car snob, but it takes the wind out the sails a little. The jump between stress and muted silence is clever, but the car just looks like he is getting into a jelly with wheels that are too small. It looks like a car from the 80’s with a new paint job. If the Walkers ad is all about making something brilliant from nothing, the Peugeot 508 ad is all about trying to polish a turd. A lovely try, let down by a really bland looking product. But again, judge for yourself. 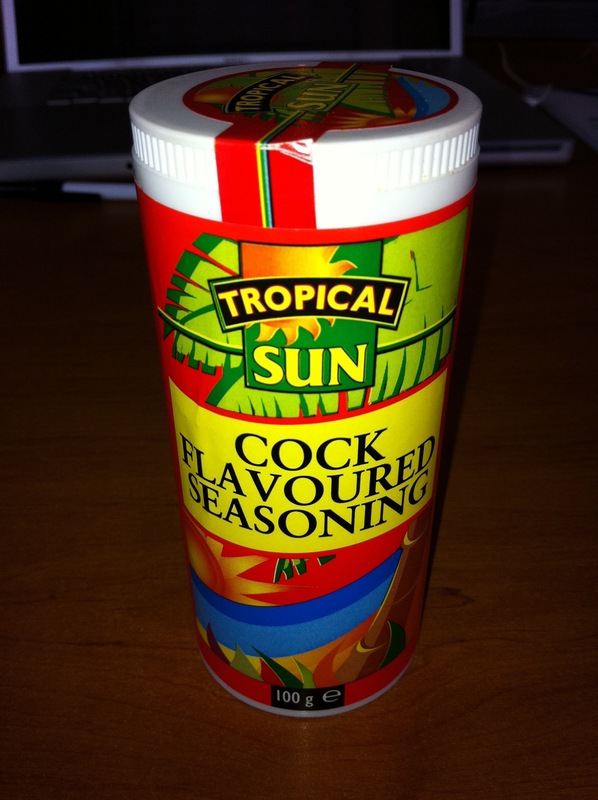 But I don’t think I want to add it to anything i’m going to eat this Easter. And what is that at the bottom right of the label? I have just read the instructions on the side of the pack and it comes with some helpful tips. Apparently…. VW ads were one of the reasons I joined the design industry. I always thought they were brilliant, even when I was growing up – way before I understood the power of branding, brand values and the actual effect they were trying to create with the VW = Reliable link. So here are a few ads. Starting with my favourite of them all that is a new US ad. And then followed by the oldest one I could find. This was written by David Ogilvy – My all time advertising hero and writer of the most influential advertising book of it’s day called ‘Ogilvy on Advertising‘. When you consider the age of this ad, it is remarkable how many of the visual cues are still used today by the latest generation of VW ad designers. 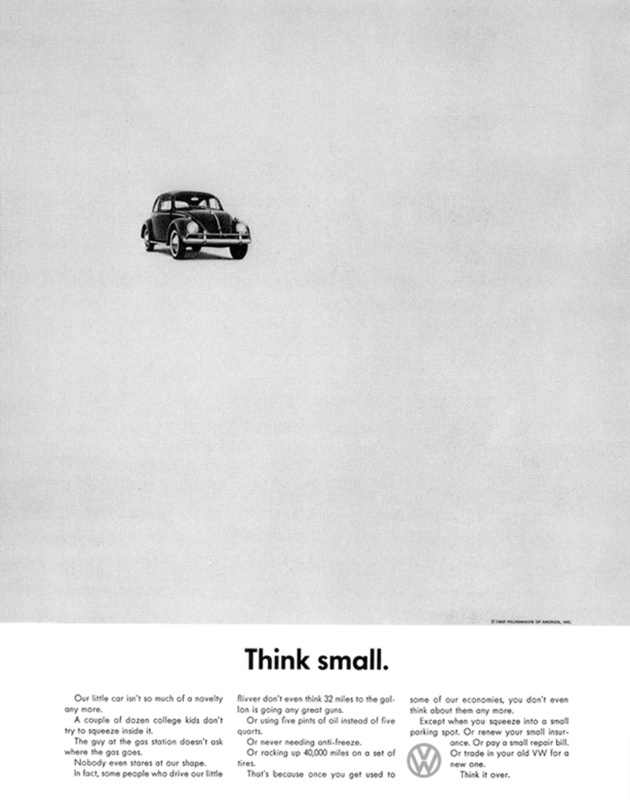 Think Small - an Early ad by David Ogilvy for VW - Look at how similar the design is to the VW ads of today! Then a more recent one again that is quite clever and funny, but showed how they were playing the quality and reliability theme out. Maybe to the point of doing it to death. I had been quite excited about Carluccio’s opening in Nottingham and managed to miss the opening night, but have now been and sampled their lovely food. I went yesterday with my mate Tim Garratt (Nottingham’s most prolific blogger) for lunch and it (not he) was gorgeous and great value. It was also packed by 13.00 with people waiting for seats when we left. We both had two courses from the fixed price menu of a bruschetta to start and then some chicken in breadcrumbs thing to follow. Gorgeous, simple food without any pretention but the sweetest tomatoes you will try this side of venice and for me, the nearest I have found anyone coming to the quality and tastiness of the bruschetta I had in Rome some years ago. With (soft) drinks, bread, coffees and service it all came to £34.00. Not bargain bucket stuff, but really good value for such a lovely meal, with quick friendly service. So I’ve been again today for a brunch. That was maybe even nicer. Scrambled eggs with mushrooms on gorgeous oil soaked italian toasted bread. Three of us went and all had similar versions of an italian brekkie and it came to £27.00. Again not for nothing, but worth every penny. We left around midday, just as Jamies up the road was opening. 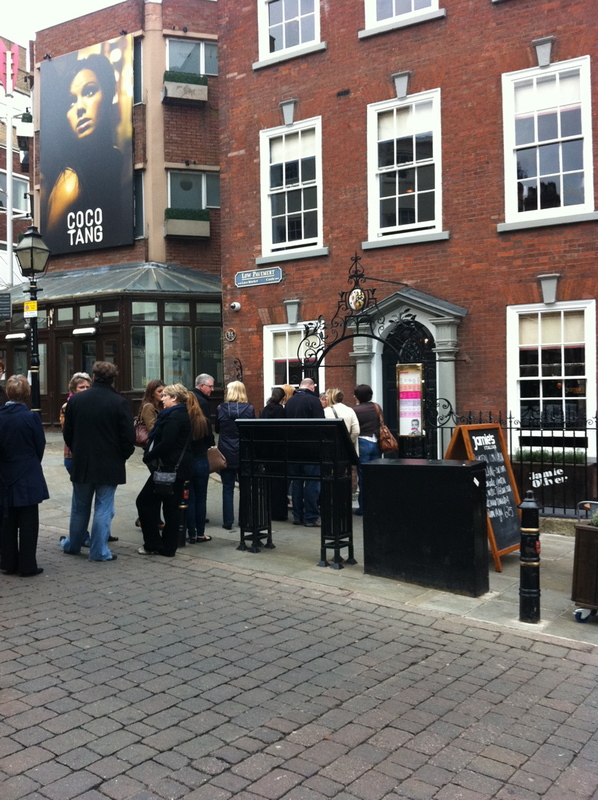 They had a queue. 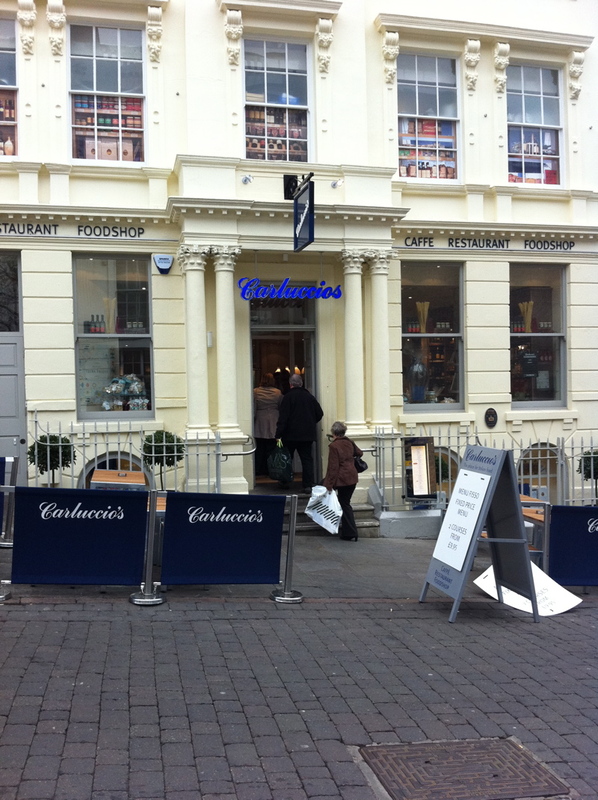 I’m still to try it for myself, but the light friendliness and tasty food of Carluccio’s will be hard to beat.